Have you ever wanted a relaxing, spacious, comfortable outdoor kitchen? Then you have come to the right place! This Houston outdoor kitchen is fully stocked and loaded with a granite countertop and stainless steel appliances. All of our products are built only with quality, top of the line materials, and the results reflect this quality, as you can see. Have some friends over, host a party, or just hangout. 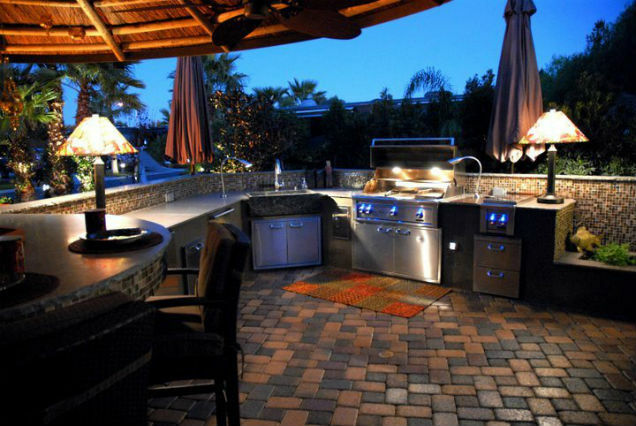 Its time to show off that fancy outdoor cookware and grill with your family in this dazzling outdoor kitchen. Customers can build their custom outdoor kitchen today with the best outdoor kitchen company in all of Houston! We use only the highest quality materials in every single one of our outdoor kitchens. Satisfaction is 100% guaranteed, and this Houston homeowner would agree! Here at Houston Outdoor Kitchen Pros, we build the most high quality outdoor kitchens for the best price in all of Houston!